It came to light late last year that the pine coffin which once held the remains of JFK assassin Lee Harvey Oswald, was the subject of a court battle in Texas. 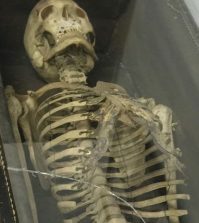 After the 1981 exhumation to confirm the identity of the remains and silence conspiracy claims, Oswald was reburied in a different coffin due to deterioration of the original. Oswald’s brother Robert, who purchased the original coffin in 1963, believed it had then been destroyed. He had no idea it was sitting in storage at the Baumgardner Funeral Home in Fort Worth until Allen Baumgardner Sr., an assistant at the exhumation, put it on the auction block in 2010 along with other relics from Oswald’s funeral. The coffin, a grim reminder of the Oswald family’s dark and tragic past, sold for $87,468. In court proceedings, Baumgardner claimed the coffin was a gift from Robert to his brother, and therefore belonged to the funeral home. Last month, however, a Tarrant County, Texas judge ruled in favor of Oswald. He said the coffin was intentionally saved and its existence concealed because Baumgardner understood the value of the object. 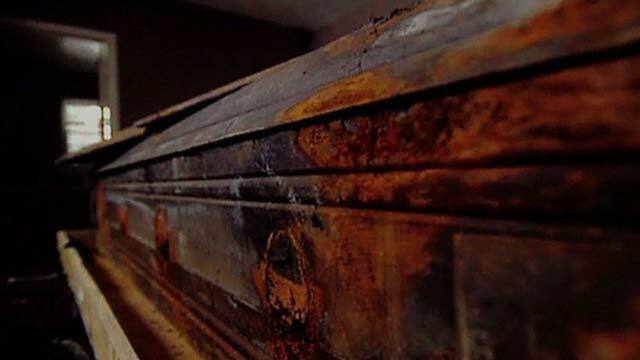 He ordered the coffin be returned to the family and awarded $87,468 in damages. Regardless of its condition, the coffin of a presidential assassin would surely make a ghastly great addition to anyone’s macabre collection. Original pine coffin that held the body of Lee Harvey Oswald from his burial on 25 November 1963 until his exhumation on 4 October 1981. Amidst conspiracy theories that a look-alike Russian agent was actually buried in place of Oswald, a fierce legal battle erupted between Robert and Marina Oswald with the former trying to stop the exhumation and the latter pushing it forward. Marina’s side prevailed, forcing an exhumation to determine who was actually buried in Oswald’s grave. 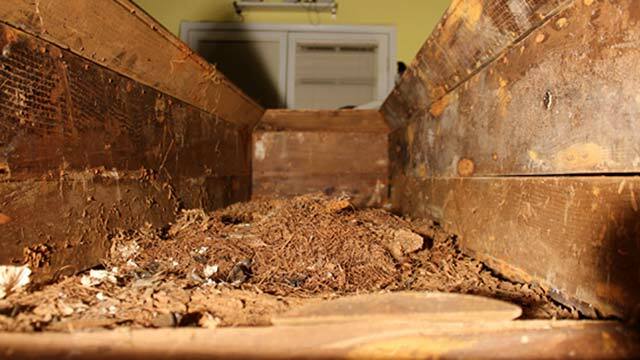 As Lee Harvey Oswald’s coffin was lifted, evidence of extensive water damage to the casket was apparent — the cover was weak in many areas and in one place had caved in partially exposing the remains. The coffin’s wood exterior was very soft from moisture damage, and had dark areas of discoloration. Visible along the sides were the tarnished original metallic ornamentation. 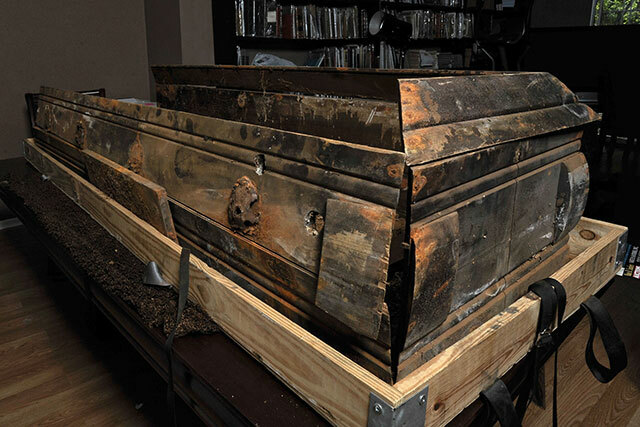 The interior of the casket also showed splotchy dark discoloration and moisture-softening of the wood. A portion of the original fabric that lined the top of the casket had fallen upon the decomposed remains. After a thorough medical examination, the pathologists assigned to the case officially identified the body as Oswald’s as dental records positively matched. 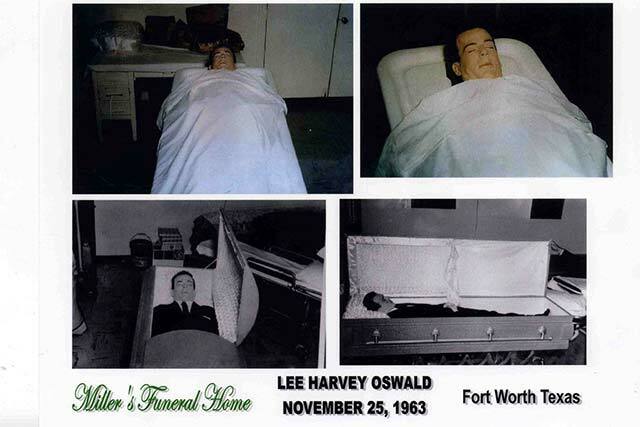 At a press conference later that day the following famous statement was made, “The remains in the grave marked as Lee Harvey Oswald are indeed Lee Harvey Oswald.” After the news conference, Oswald’s remains were transported back to Rose Hill Cemetery for re-interment in a new casket and vault. 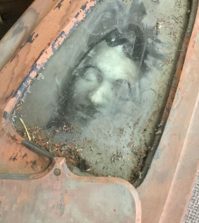 The original deteriorated coffin offered here, measures 80″ long x 24″ deep, with the thickness of the sides of the casket approximately one inch. Sitting on wood crate which measures 84″ x 24″. Accompanied by a Letter of Authenticity by Funeral Director Allen Baumgardner, who assisted at the original embalming of Lee Harvey Oswald and later purchased the Miller Funeral Home along with all of its property. I agree with the judge. This coffin is not historic, although the person who was in it was. 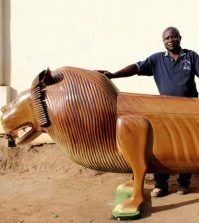 The person who bought the coffin should be the owner for eternity and he should decide what happens to the coffin, not some funeral home trying to make a buck. Good for the judge.Historic artifact?wtf Can be gained in the name of history by displaying it? The right thing was done in the name of the deceased and his heirs.Only reason to keep it would be to benefit monetarily and that should be the family’s decision. I think the appropriate place for this object would be the Smithsonian – it should NOT be destroyed, or put into someone’s private collection. 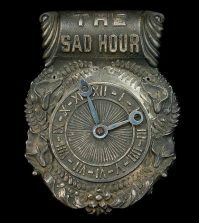 It is an historical artifact from a devastating time in American history and should be preserved as such.